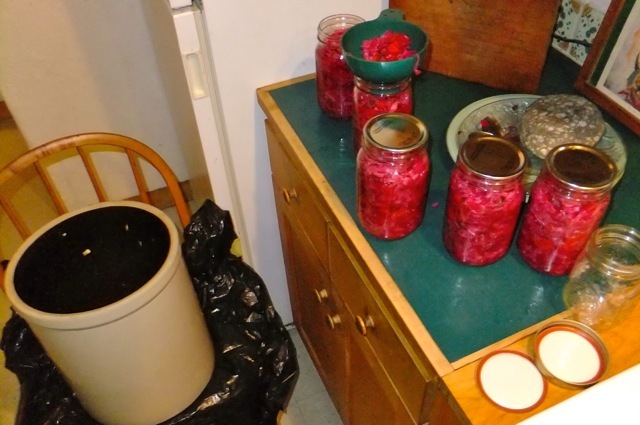 Preserving homegrown food is becoming a regular practice for many gardeners and as they delve into fermentation they want reassurance that preparing and serving fermented vegetables will not harm their family. Across the planet, traditional people have developed the art of managing microbes to age their food without refrigeration or canning. Europeans ferment sauerkraut and olives; Indians ferment cucumbers and make chutney, while Indonesians ferment soybeans as tempeh. Koreans value kimchi, their fermented vegetable preparation so much, they recognize it as the national dish. Twenty five-years experience making sauerkraut gave me the confidence to explore making kraut-chi the old fashioned way, without airlocks or European crocks. Besides that, I have been collaborating with microbes in compost-making for even longer; including studying the science and teaching others composting. By understanding a bit of the microbial ecology within a crock of fermented vegetables, gardeners can ferment with confidence. Kimchi, and an American variation called kraut-chi can be made at home to spice up any meal while strengthening our intestinal flora with probiotics, or live microorganisms. Fermenting without the use of a culture or starter, kimchi introduces us to the mysteries of inviting beneficial microbial populations to take up residence in a crock of homegrown vegetables and later in our digestive tract. The beauty of this simple fermentation is like so many things in life: what it needs to thrive is right there if we can recognize it. There are hundreds of recipes for Korea’s national dish, based on seasonal vegetables. A museum in Seoul is devoted to its history and promoting kimchi’s benefits to an urban population rapidly moving toward fast food. Many are made with a spicy paste that includes oyster sauce and anchovy paste that contribute to the powerful pungent odor. These combined with garlic, chile pepper and ginger produce a potent condiment. Traditionally, the earthenware fermenting jars called onggi are stored outdoors and buried in the ground to regulate the fermentation temperature during winter. Wealthy urban South Koreans and Korean-Americans have begun using high-tech kimchi refrigerators that can be set for temperatures to ripen kimchi. For those who can’t afford this new appliance, a compact fridge located in another room to contain odors, is common. Sandor Katz, author of Wild Fermentation, “the fermentation bible according to Newsweek,” coined the phrase kruat chi a modified version of fermented vegetables without the anchovy or oyster sauce. Twenty five-years experience making sauerkraut gave me the confidence to explore making kraut-chi the old fashioned way. Besides that, I have been collaborating with microbes in compost-making for even longer; including studying the science and teaching others the practice. Cabbage has a naturally occurring dormant microflora, or community of microbes that will consume the sugars in cabbage juice once the conditions are right. By managing the environment through adjusting moisture and temperature and adding salt, the process of fermentation encourages certain lactic acid-producing bacteria or LAB. The process ensures that plant juices and water displace oxygen in the fermenting vegetables creating an anaerobic medium. The salt raises the pH discouraging surface molds and organisms other than LABs and the salt also slows the ferment, enhancing the flavor. Regulating the temperature modulates the succession of microbes that inhabit the batch of kimchi and allows the ferment to progress slowly. The procedure in brief: Be sure to start with fresh vegetables, not those beginning to decay. Chop the cabbage leaves to cut their cell walls and release the juice and carbohydrates, and add salt to increases the drawing action. Rub and crush the salt into the cabbage to be more effective. After adding the remaining chopped carrots and onions or other chopped vegetables, garlic, ginger, hot peppers and other ingredients, mix well. Scoop the mixture into a 5-gal ceramic crock, stopping to tamp down every two inches of vegetable mixture to press out air during packing. Moisten a fresh cotton dish towel with water and lay it over the chopped vegetables. Select a flat plate that fits snuggly into the crock, place it on the towel and weigh it down with a clean large stone If there is not enough liquid to keep the vegetables submerged after a couple of hours, add a little water. In warm weather the ferment accelerates, so rinse the cloth. Change the cloth if benign white yeast forms on the surface. The process can take eight weeks. There are as many ways to make fermented vegetables, as there are people. Each item has variables from the container and the choice of vegetables to be fermented to the amount of salt to use, the season of the year, where and how long to age it. Why go to all this trouble for putting up vegetables for winter when you could freeze or can them? In fact, fermented foods offer health-enhancing properties that go beyond preservation. To the uninitiated, fermenting vegetables in the home can smell like rot. The various smells released during the process are indicators of the stage of maturity and —in the rare instance—can warn us if the wrong populations are growing, much like the odors of a properly decomposing compost pile can reveal much to an experienced practitioner. Odors of sweat or cheese are normal. Even a rotten egg odor, released by hydrogen sulfur releasing bacteria, only indicates more aging is required. Preserving homegrown food is becoming a regular practice for many gardeners and as they delve into fermentation they want reassurance that preparing and serving fermented vegetables will not harm their family. Fred Breidt, a microbiologist with the USDA is qualified to discuss this. “My research program is focused on the safety and microbial ecology of fermented and acidified vegetable products.” In a paper on cucumber fermentation brine he wrote, “Lactic acid bacteria are highly efficient killers of other bacteria, and they do a marvelous job. This is why vegetable fermentations pretty much always works. It’s been working for thousands of years. It’s one of the oldest technologies known to man and it always works, and the reason is these lactic acid bacteria are very good at what they do, and we take advantage of that as a technology.” According to www.foodsaftynews.com Breidt said there are no known cases of people getting ill from properly fermented products. Next time you plan your vegetable garden make sure to include more cabbage, carrots, onions, garlic and hot pepper!